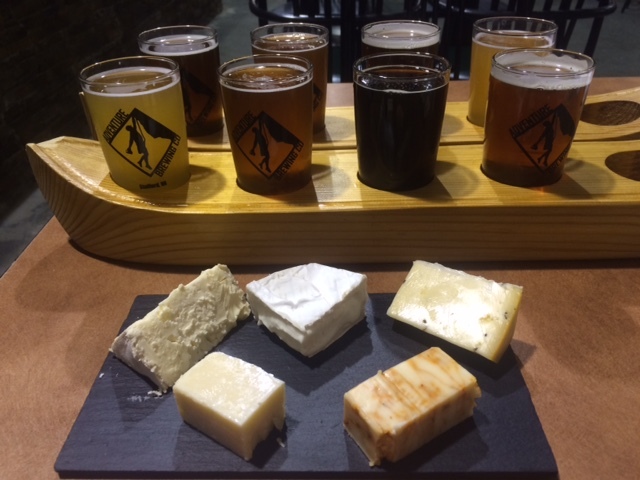 The Cheesy Beer Wench – Craft Beer and Awesome Cheese. Together at Last. Craft Beer and Awesome Cheese. Together at Last. We just love when new breweries open. It’s like a beacon, calling us to bring out the cheese and take a road trip. 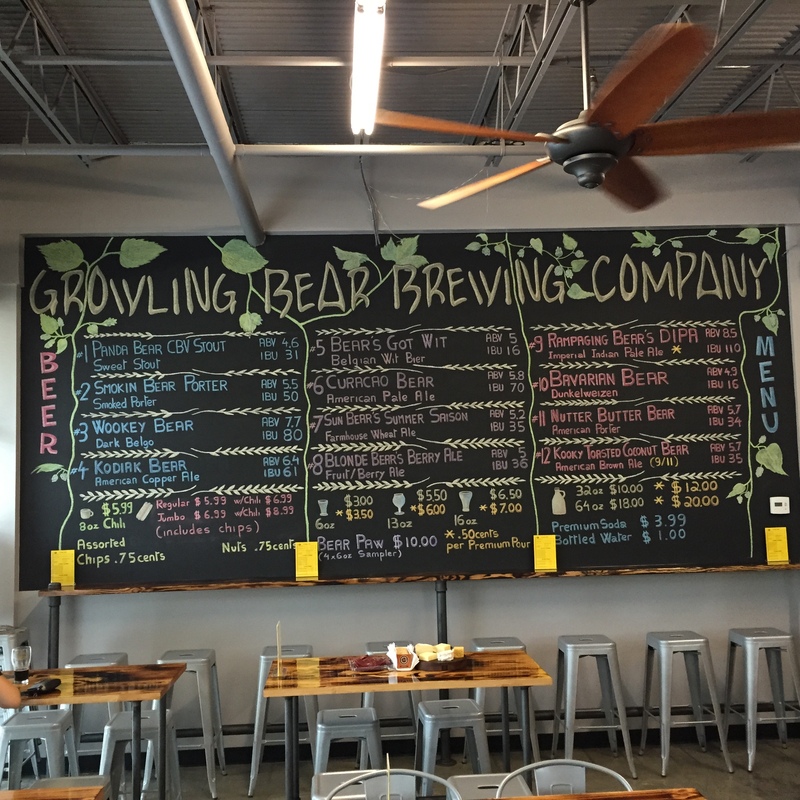 To start our Labor Day Weekend off right, we decided to head to the eastern end of the county and visit a newly opened brewery called Growling Bear. The first thing you will definitely notice is the theme: bears everywhere! Pictures of bears line the walls, and all the beers have a bear themed name. And while most of us would ooo and aah over the cute pictures of the grizzly or the panda, the reality is bears are powerful creatures. And so are the brews at Growling Bear. All of our cheeses for this pairing were bought at Wegman’s this time around. I usually try to get a variety of cheeses from a variety of stores to give others an opportunity to find nice pairings at a reasonable cost, but the cheese aisle here is just too fantastic. I went a bit crazy. 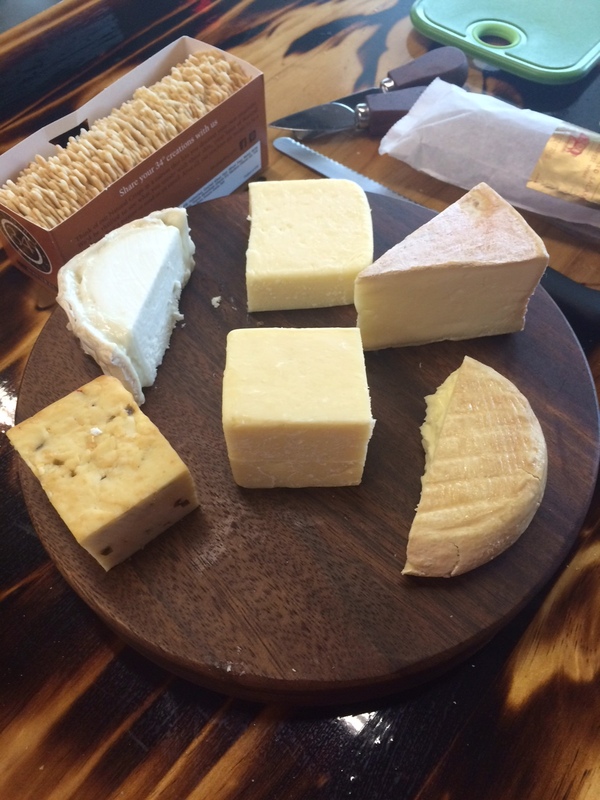 Here’s the line-up: Collier’s Welsh Cheddar, Castello Aged Havarti, a Bucheron Goat Cheese imported from France, a Bourbon Washed Pie d’Angloys made for Wegmans’ in France, and last but not least, Dorset raw milk cheese from Consider Bardwell Farms in Vermont. 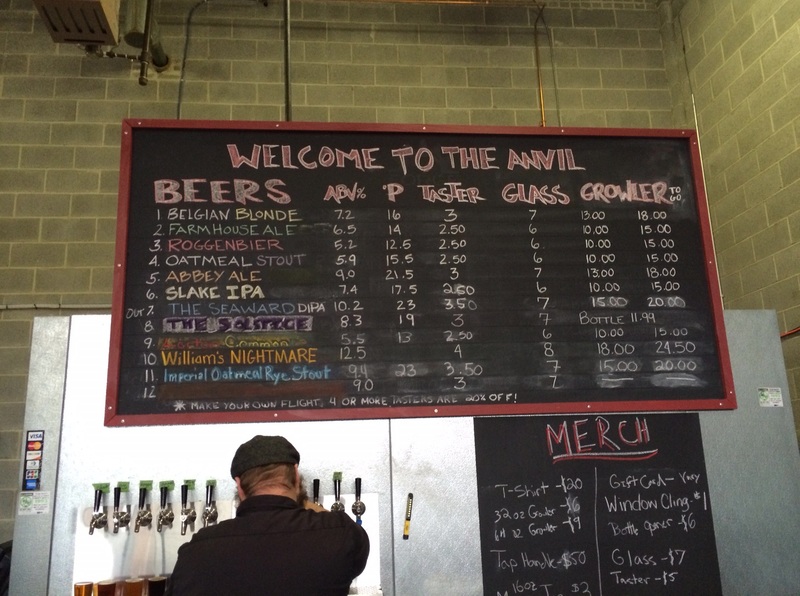 Growling Bear, at the time of our visit, had 11 brews on tap, with one more scheduled to be released on 9/11. As we always do, we requested a flight of all the available brews, then got down to the business at hand. Because of the number of brews available, we’ll only be reviewing the most unique or favorite pairings we had that evening. Bear’s Got Wit was a very pleasant unfiltered Witbier. It was nice and smooth, with a bit of a citrus finish. The Welsh cheddar paired nicely with it, and seemed to open the beer right up so you could enjoy the wheat and orange notes without overpowering the beer. The goat cheese, however, brought the citrus right up to the front of the palate, and rounded out the beer nicely. Blonde Bear’s Berry Ale was a surprising light berry ale. The fruit did not overpower the beer at all, which is what we tend to find in quite a few fruit flavored ales. We were quite surprised when we tried the aged Havarti and our mouths were full of very pleasant berry flavors, without compromising the overall flavor of the beer. We also tried the goat, and found it gave the beer a smoother finish, but didn’t mute the delicate berry flavor. Our absolute favorite pairing of the evening was with Growling Bear’s German Dunkelweizen, Bavarian Bear. This dark wheat beer had a nice malty backbone, finished light, and was very drinkable. First we paired this with the Dorset cheese. The taste of caramel came forward fantastically, giving a bit of sweetness on the finish. Once again, the Welsh cheddar surprised us and brought out a slight toffee or molasses flavor that I think would be missed if you didn’t eat this cheese with this beer. But the best cheese pairing seemed to bring all of those components together and take this brew to a new level. The Pie D’Angloys was the clear pairing winner with this beer. We wish we could tell you why specifically, but it was beyond words. The cheese itself has a bit of an earthy taste and “aromatic” nose, so it was quite surprising how well the beer and cheese played together. It’s always difficult to try to get a great pairing with a peanut butter beer. But the Nutter Butter Bear American Porter was an exception. We found two cheeses that are definitely this beer’s friend: the Dorset and the aged Havarti. If you want to pull the coffee and chocolate notes forward, have the Dorset cheese. It really amped up the coffee, with a bit of dark chocolate on the finish. Love peanut butter? Pair this with the aged Havarti. The Havarti really pulls the roasted peanut flavor to the forefront, and the finish is very smooth. By now you know of the Wench’s love/hate relationship with IPAs. So I’m always happy to find a well done Double IPA at a local brewery. The Rampaging Bear’s name is the perfect description of this DIPA. At a whopping 110 IBU, those who are not accustomed to this level of bitter should probably stand back. However, there seemed to be enough malt to balance it nicely for me. If you are a fan of the citrus, then pair this with the goat cheese. For us, we got a very strong pink grapefruit finish. So strong in fact, I actually wondered if someone had switched my beer with juice. The Welsh cheddar conversely muted the citrus notes, sweetened the beer on the finish and muted some of the lingering bitterness. Last, but certainly not least, was the Panda Bear CVB Stout. Super dark, this sweet stout had all the notes I love in a stout: chocolate, vanilla and bourbon (hence, the CVB!). If you want a good dose of the vanilla flavor, pair this with the Havarti. While the vanilla is definitely brought forward, it isn’t overpowering and you end up with a bit of the bourbon sweetness on the finish to round out the experience. If you’re a fan of bourbon, the Welsh cheddar is the way to go. The cheddar really amped up the bourbon notes. I’m definitely going to have to go back with triple crème Brie and see what happens. Even though Growling Bear had only been open 10 days at the time of our visit, we were very impressed with how solid each brew was, and we are very excited to see what’s coming next. Our favorite part is they plan to try to have 4 dark beers as their flagships on tap at all times. Not only that, but there will be 4 rotating seasonals and 4 rotating experimental brews, rounding out the 12 taps. Everyone was very friendly, and we even got a chance to talk to the brewer. He knows his stuff and is definitely going to do very well. Be sure to visit their website at their website and follow them on Facebook and Twitter too! 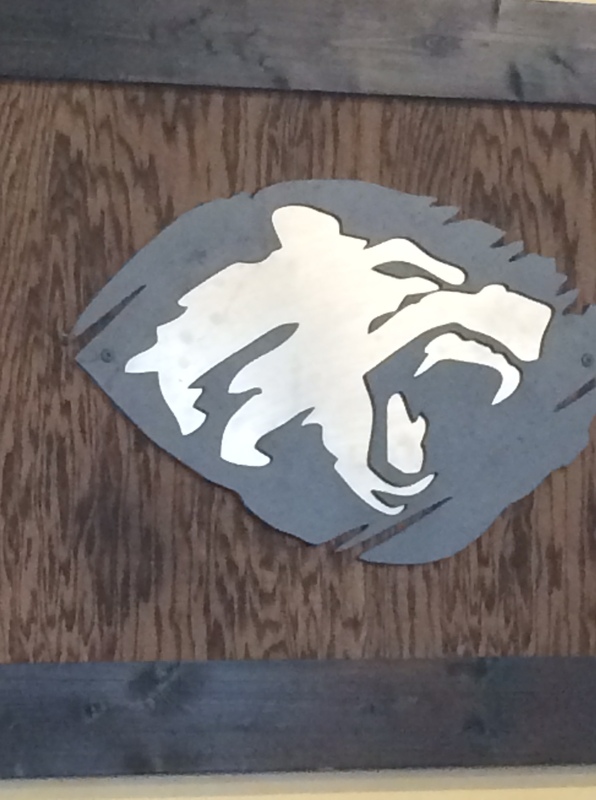 So pack up a lunch or some cheese and head over to Growling Bear Brewing. You will not be disappointed. It’s been a long time since I’ve written about my cheesy beer adventures. I discovered it’s rather difficult to do cheese and beer pairings when it’s 90+ degrees outside, because all I really want is a burger or fish tacos. Since the close of summer is rapidly approaching, I felt the need…the need for cheese. And of course great beer to go with it. We headed out to Old Bust Head in Vint Hill, Virginia. The area is actually an old Army base that had been shut down and has now been converted to a combination of residential and some retail space, to include this lovely brewery. Today they had 14 brews on tap! Igor and I tried cheese with every brew, but I’m going to focus on our favorite pairings of the day. The Chukker, a classic Czech Pilsner, was our first pairing that surprised us. We paired this nice light brew with Beecher’s Cheddar, aged 26 months and super sharp. The cheese brought out some sweetness to the beer we truly did not expect. Because this brew clocks in at only 4.4% ABV, it’s a great session beer you can drink easily. Another lovely beer was their Sumerduck Saison. A very delicate saison, it went well with the cheddar. The cheese brought out some floral notes. Next we paired it with an herbed goat cheese from the Vermont Creamery. The goat cheese brought out some sweetness and worked very nicely with the herbs. It didnt’ overpower the flavor profile of the saison, which was nice. As far as English Pale Ales go, the Busthead is a really nice one. Slightly bitter, slightly roasty this beer was fabulous with the super sharp cheddar. It tamed the bitterness and added a bit of sweetness and creaminess to the mouthfeel. Vixen, an Irish Red with a nice malty profile, was next up. The color on this beer is just beautiful. We paired this with a triple crème Brie from Wegman’s. The cheese rounded out the maltiness quite nicely, and left you with a hint of caramel on the finish. With my newfound love of IPAs, I couldn’t wait to try the Graffiti. What a nice IPA! The goat cheese brings out the brightness of the beer. We also tried a very mild blue cheese from Oregon. Having heard blue cheeses were really good with IPAs, I had to give it a try. I discovered the blue cheese complimented the bitterness in the beer, but you don’t lose any of the flavor. While in theory I think blues would work with IPAs, as with any craft beer and cheese pairing, I think it completely depends on the brewery and the hops profile of the beer. Next we sampled the Apricot IPA. This beer is very fruit forward and you can definitely get the apricot on the nose and palate. Interestingly, pairing this with the sharp cheddar negated the apricot flavor, but then the beer developed an almost orange cream profile on the palate. This pairing by far was the most intriguing and surprising. As you know, I’m a huge stout fan. OBH’s Gold Cup Stout is one of my absolute local favorites. So, of course, I had to pair this with my favorite cheese, the triple crème Brie. The coffee notes in the beer paired so nicely with the creaminess of the cheese. It was so good I could have just spent the rest of the afternoon drinking this stout and eating the cheese. Last but not least was the Vanilla Porter. A limited release brew, the nose on this one is definitely pure vanilla. There’s a bit of sweetness to it, and I would have to say this would be a great dessert beer. Pair this with the triple crème Brie or a huge slice of plain ole cheesecake. We loved visiting Old Bust Head today. And as luck would have it, they are planning their first Bleu and Brew Festival! They will have several local breweries on site, and will have cheeses to pair. 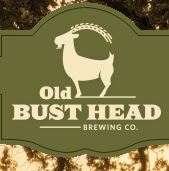 The event is scheduled for September 19, 2015 and tickets are on sale now (http://www.oldbusthead.com/bleu-brew-fest-obh) and I highly recommend going. Follow them on Facebook here to get updates. Even if you can’t go to the festival, definitely visit Old Bust Head. You won’t be disappointed. We love when a new brewery opens. It goes straight to the top of our list of places to visit. 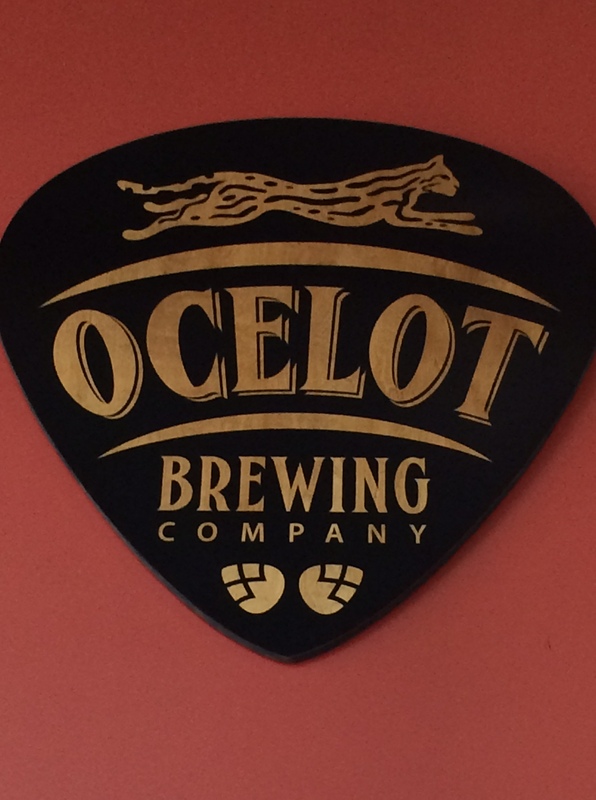 Ocelot officially opened up on April 11 and has been picking up steam ever since. Don’t let the fact there are only 3 brews on tap deter you. With a huge space, a beautiful bar top made from reclaimed wood and very friendly staff, they are worth the drive. First up was the Lemon Yellow Sun. This nicely done Imperial Wheat Ale is nicely hopped and super smooth to drink. We paired it with fresh goat cheese I had mixed honey and fresh thyme, smeared on a Triscuit. The cheese mixture really brought the brightness of the lemon and some sweetness on the finish. Next, we tried some of Cabot’s Alpine Cheddar. This cheese highlighted the wheat in the beer, while bringing forward some of the herbal qualities of the hops. Next was the Tangerine Trees IPA. Very citrusy, with a nice dry finish, I can definitely see myself drinking a lot of this after a hard day of yard work. The cheddar worked wonderfully with this brew. The tangerine/orange notes really stood out and the cheese created a creaminess that was unexpected. I almost felt like I had a hopped up orange creamsicle in my mouth. Last but not least was My Only Friend. This Russian Imperial Stout really exceeded my expectations. The taste was fantastic, and they served this stout at the proper temperature! I’m a huge stout lover, and it was awesome not to have to wait for my beer to warm up before enjoying it. First cheese pairing was a triple crème Brie. Fantastic pairing! The coffee and chocolate notes are ramped up and it was like a mocha latte with a shot of booziness. I also had some Smoked Gouda (real gouda…not processed cheese product! ), so tried some with the stout. If you are not a lover of coffee flavor in your beer, this is the pairing for you. The smoked gouda almost completely eliminated the coffee flavors, while accentuating the cocoa notes. It was quite a surprising pairing. Igor and I are looking forward to going back to Ocelot soon. We were able to chat with Adrien, one of the founders/owners during our visit and he was awesome. On our scouting mission the weekend before, we talked at length with Sebastian, also one of the founders/owners and got a quick tour of the brewery which was great. Melissa, who was working behind the bar, was fun to chat with and very helpful. We really had a great time. Please take the time to head out there for a visit. We promise you won’t be disappointed. Today was a beautiful day and we took advantage of it. 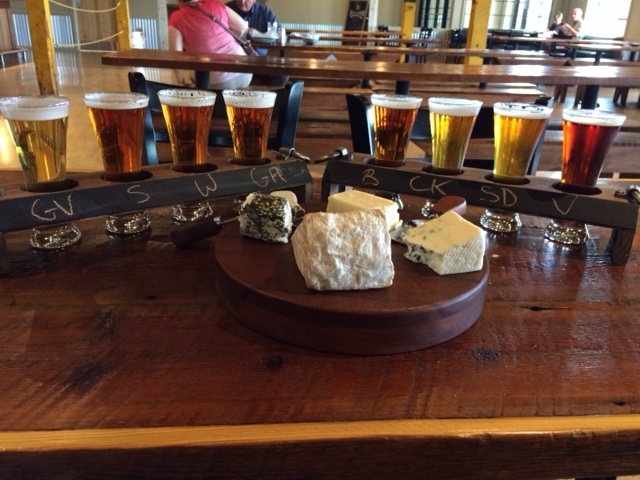 We ventured out to Fair Winds Brewing in Lorton, Virginia with our selection of cheeses, eager to do some pairings. 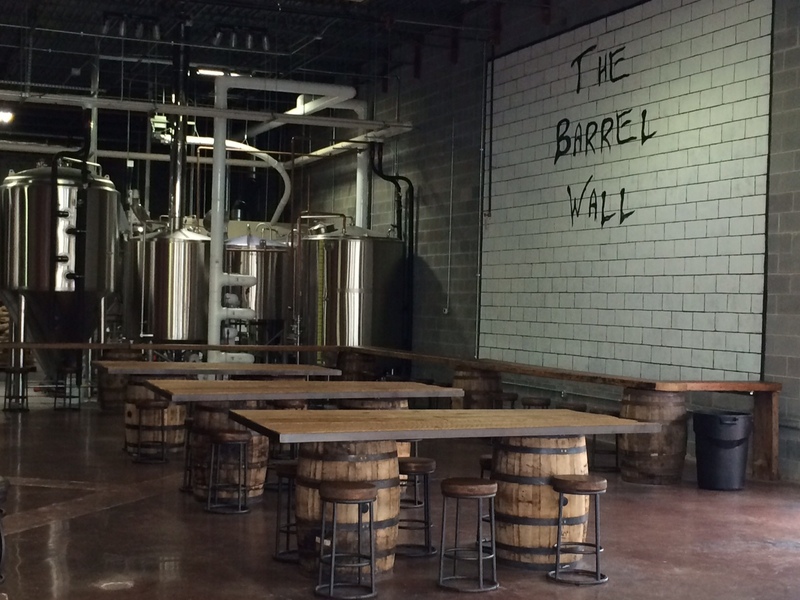 The brewery has only been open since early March, but we had heard some really great things about their brews. The space itself is bigger than it would seem from the outside and is very inviting. There is a ton of natural light spilling in from the windows and the staff is happy to see you come in. Our first beer was the Quayside Kolsch. What a lovely beer! We’ve tasted quite a few beers of this style and we agreed this is at the top of our list. The beer had a nice malt backbone. We paired it with the Cypress Grove Midnight Moon aged chevre. The cheese brought forward the floral notes without overpowering the beer as goat cheese can sometimes do. Next in the line up was the Following Cs Pale Ale. On it’s own, the pale ale was what you would typically expect. We paired it with the Boar’s Head Butterkase and wow! The Cascade hops were front and center. The cheese also gave a slight sweetness to the beer we didn’t expect. Probably one of our favorite pairings was the Cypress Grove chevre and butterkase with the Howling Gale IPA. The Butterkase pulled forward the background caramel notes, whereas the chevre brought forward the more floral, earthy tones in the brew. It was really great to get two different results from the same beer. The Bulkhead brown is a super dark brown ale, full of roasted walnut and pecan undertones typical in a beer of this style. We like this beer best with Yancy’s Fancy Double Cream New York Aged Cheddar. The high butter fat content of the cheese really accentuated the nuttiness and gave a great mouth feel to the beer itself. Last but not least was the Flemish Stout. This stout is definitely not like any we’ve had before. Brewed with Belgian yeast, this beer has a very light coffee aroma with a hint of soured yeast on the nose. On the palate, the beer had a great mouth feel with muted hop undertones and a slight chocolate flavor. Because the flavors in this brew are so subtle, it was really hard to find a cheese to compliment it, but the Cheesy Beer Wench never gives up. After a bit of experimentation, the Cypress Grpve Midnight Moon was the clear winner. The cheese didn’t overpower the subtleness of the flavors, but rather complimented them and giving a richer mouth feel to the beer. 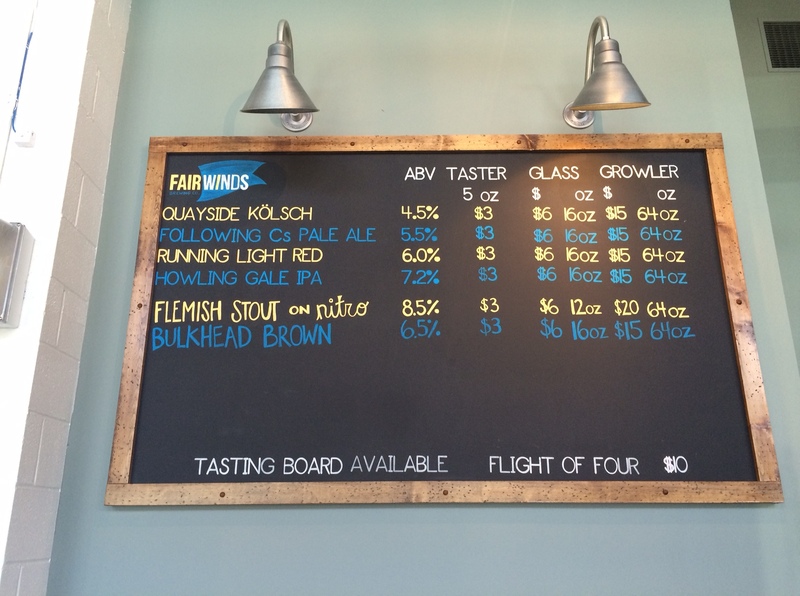 We really enjoyed our visit to Fair Winds and are very excited to go back when they introduce new brews. Until then, we will be looking out for the Quayside and Howling Gale on tap in the area. March Madness: Time To Purge! You know how sometimes life gets in the way of a good thing? That happened to me! 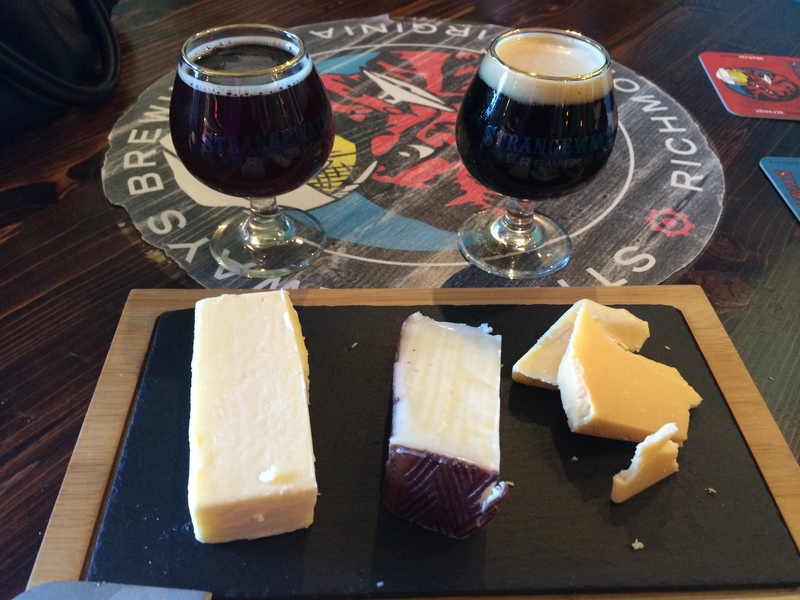 It seems like forever since I’ve written about my beer and cheese adventures. After some thought, we decided a purge of the beer and cheese lingering in our refrigerator was in order. We’ve really missed sharing our thoughts with all of you and are eager to get back on track. 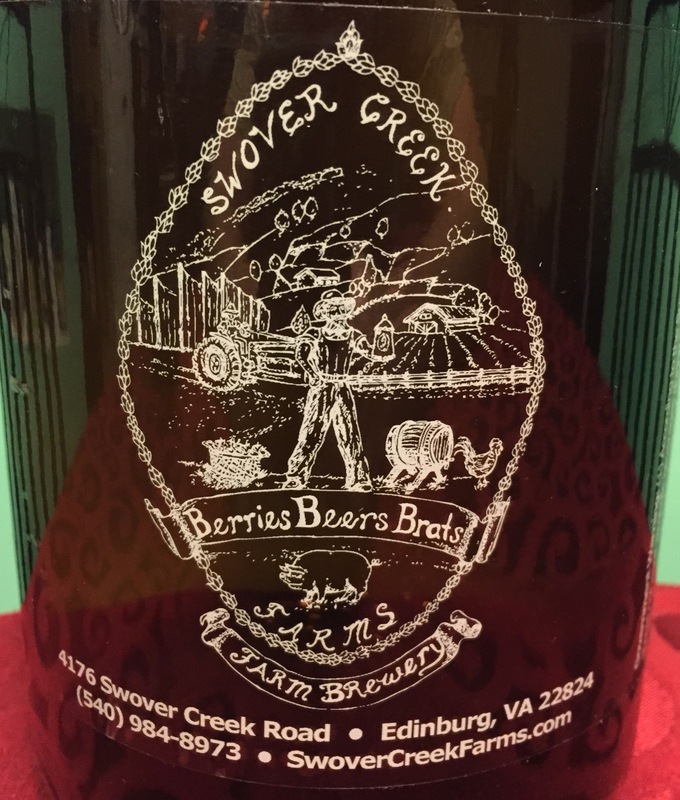 First beer up is a very lovely Oatmeal Stout from Swover Creek Farm Brewery in Edinburg, Virginia. If you get a chance to visit, please do! Right now they are brewing and serving right out of their house, but are in the process of building a tasting room. We paired this with several cheeses, but the best pairing by far was with an aged Gouda. We’d love to tell you who made the cheese, but the label has been lost 🙂 The cheese brought forward the coffee and roasted notes very nicely. 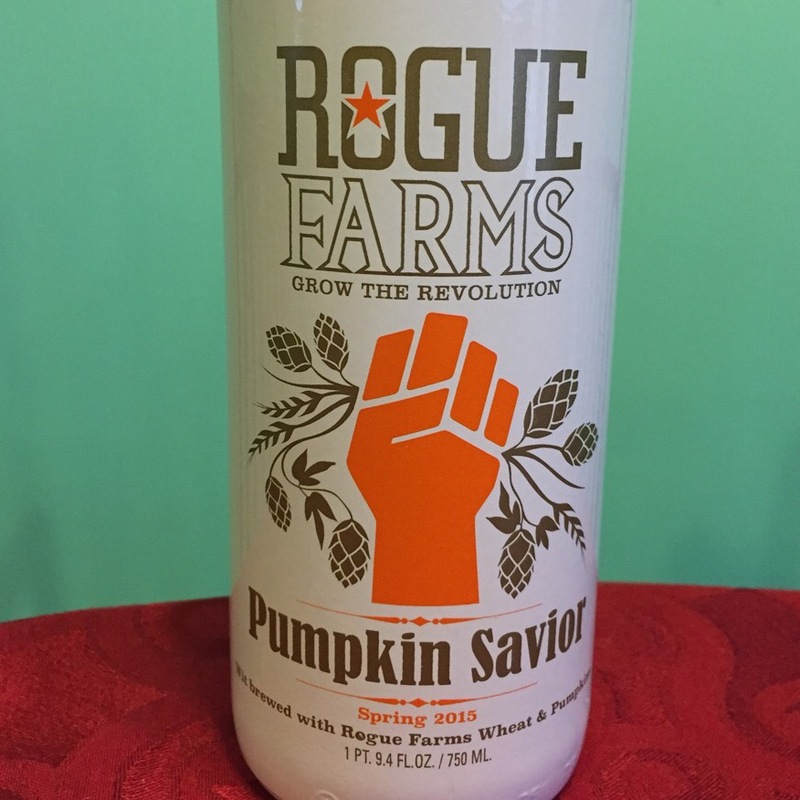 Rogue Brewing has just released for Spring 2015 a Wit brewed with pumpkin and wheat called Pumpkin Savior. I never thought we’d be drinking a pumpkin beer in the spring, but it’s actually very nice! Definitely is not like the spice laden brews you find in the fall. There is a hint of spices on the finish, but it’s not overwhelming. And if you’re a hater of sweet pumpkin beers, this is the one for you. The Humboldt Fog Goat Cheese cancels out the pumpkin and spice flavors, leaving you with a really great Wit beer flavor on the finish. It also pulls forward some of the rye flavor in the background. We then tried the beer with some Bellavitano Gold by Sartori. We picked up some citrus notes which were quite pleasant. 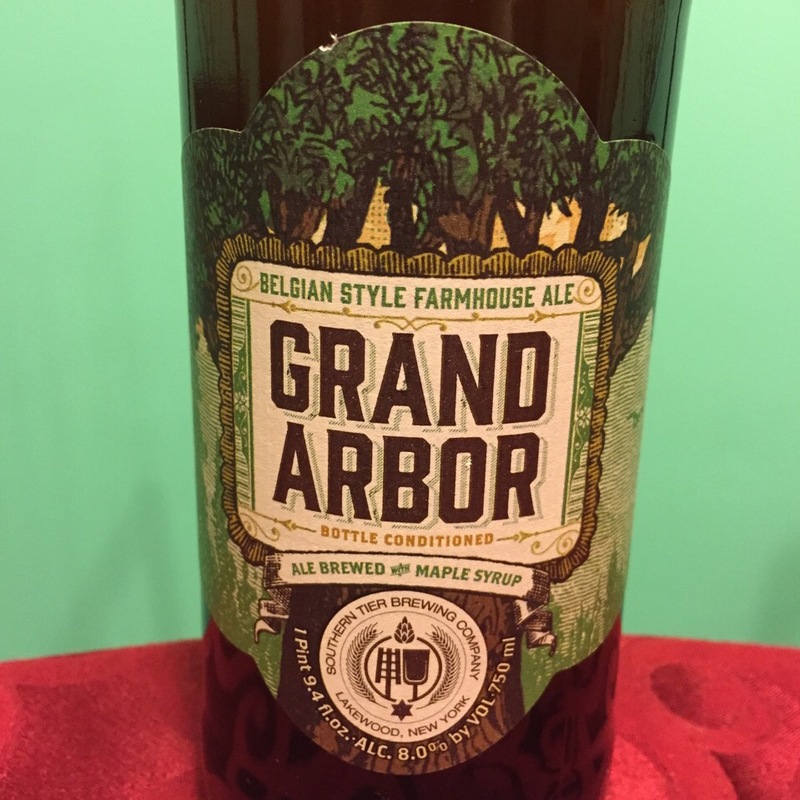 Next up was a Belgian Farmhouse Ale by Southern Tier called Grand Arbor. This one has been bottle conditioned and brewed with maple syrup. Oddly, you really don’t taste the maple at all. The bottle notes suggested an earthy cheese, so we grabbed some UnieKaas Truffled Gouda. If you are a fan of bitter beers, then pair this cheese with this beer. It really accentuates the bitter notes in the beer. Just for fun, we then paired the beer with Saint Angel from Guilloteau. Saint Angel is a really nice French triple crème cheese. This had the opposite effect on the beer. The cheese managed to bring out the sweet underlying banana notes usually found in Belgian beers, but then the maple appears on the finish! 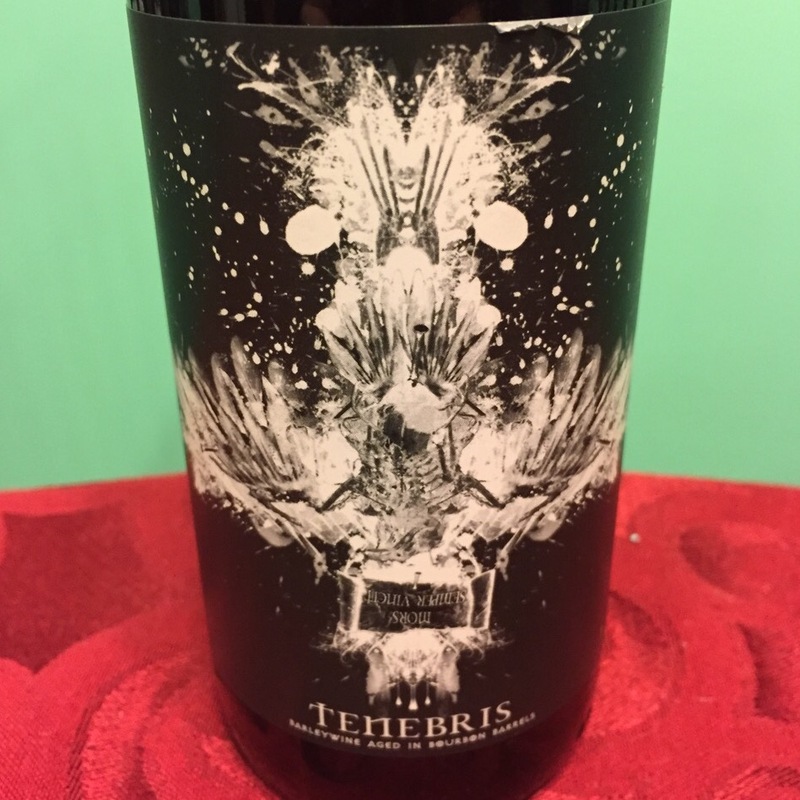 Last beer of the evening was the Tenebris Barleywine aged in bourbon barrels from Adroit Theory in Purcellville, Virginia. This brew has a real kick to it, but a pleasant sweetness you expect to find in a barrel aged beer. The first cheese pairing was a Camembert from Ile de France. It really complimented the beer without changing the flavors at all. Truly a very nice pairing. Even better, the St. Angel turns this wonderful brew into a dessert beer. It pulls all of the latent bourbon sweetness right to the front of your palette. By far this was the best pairing of the evening. 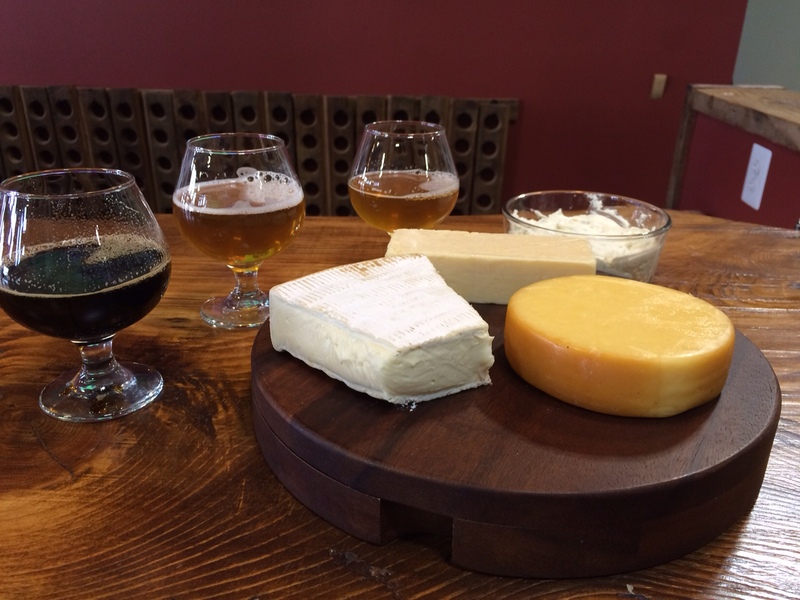 We are happy to be able to get back to our normal beer and cheese tasting routine! We promise it won’t be so long in between posts next time. And if it is, raid your fridge! You might be surprised and the pairings you can come up with spur of the moment. After a long week at work, it was time for some beer and cheese. 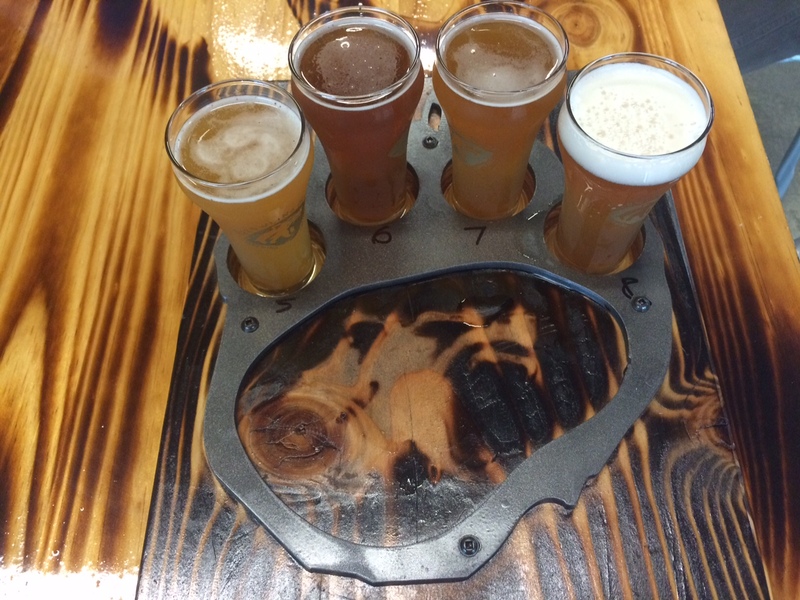 This time, we decided to brave the traffic and head to a point just north of downtown Fredericksburg and check out Adventure Brewing. As luck would have it, traffic was light and Adventure Brewing was a great place to hang out for a few hours. As we always do, we ordered their entire line up of brews. That evening they had 8 things on tap and I came prepared with 5 different cheeses! First up was the regular Backpack Wheat. A very nice wheat ale, we paired this with a bit of chipotle cheddar from Great Midwest Cheese. This pairing brought out a lot of the fruitiness of the beer that you didn’t get otherwise. On Friday evenings, Adventure infuses one of their beers with an interesting combination of things, and it so happened we were able to get the Backpack Cherry Wheat. They had infused the regular version with maraschino cherries and it was very evident on the nose. We paired this infused version with the chipotle cheese as well. All of the smokiness of the peppers came right out, but it also highlighted the sweetness of the cherries. It reminded me of a raspberry chipotle sauce you might put on grilled chicken. Their newest offering on the day we went was the Bookworm Brown ale. It was exactly what I expected from a brown ale. We paired this first with a St. Andre triple crème cheese, which sweetened up the beer a bit with hints of brown sugar. Next, we tried the UnieKaas Truffled Gouda. The earthiness of the truffles gave the beer a nuttiness that I find rather enjoyable in browns. Onto the Belgian Dubbel. We weren’t sure what cheese to try, but ending up pairing it with a goat brie. The cheese amplified everything that’s great about a Belgian Dubbel. The beer went to a whole new level of awesome, and was by far, our favorite pairing of the evening. We didn’t stop there though. A food truck was at Adventure and they were serving banana pudding. We bought some. Igor was the guinea pig and tried the Dubbel with the pudding. He went crazy! Of course I had to try it and what a pleasant surprise! 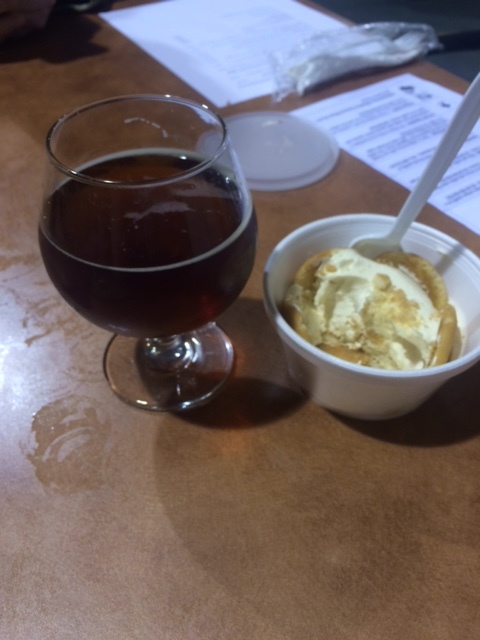 Who knew plain old fashioned banana pudding would be so good with a Belgian Dubbel? Stouts, if you’ve been following me on Twitter, are clearly my favorite beer. Adventure’s Stiletto Stout was a very nice addition to my go to stout list. A rather light bodied stout, it was full of flavor. We paired this first with the St. Andre triple crème. It was like having a mocha milkshake. The cheese added some body and really highlighted the coffee-chocolate notes I truly love. We also tried the Truffled Gouda, which pulled out the maltiness of the beer. If I had to pair this again, I’d go with the triple crème for sure. Last but not least was the Expedition IPA. First we tried it with our favorite Welsh cheddar and it wasn’t a great pairing. We moved on the goat brie and it was clearly the winning cheese with this beer. The brie really brought out the flavor of the Citra hops, but left any residual bitterness behind. We had a great time at Adventure. Everyone there was great and we had the opportunity to chat with their new brewer. We loved the fact they had a food truck on site. It’s so much fun when there’s great food available to have with great beer. 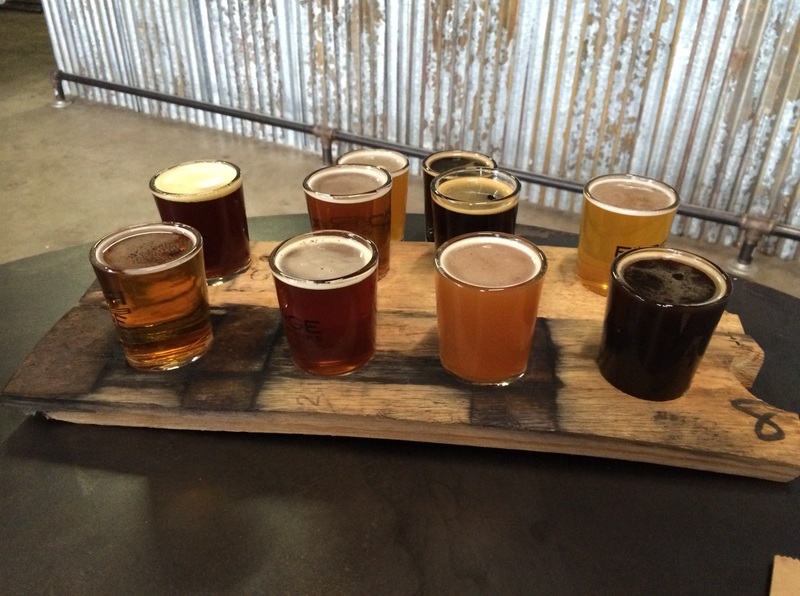 So, if you’re up for a road trip, we encourage you to check out Adventure Brewing. You’ll be glad you did. 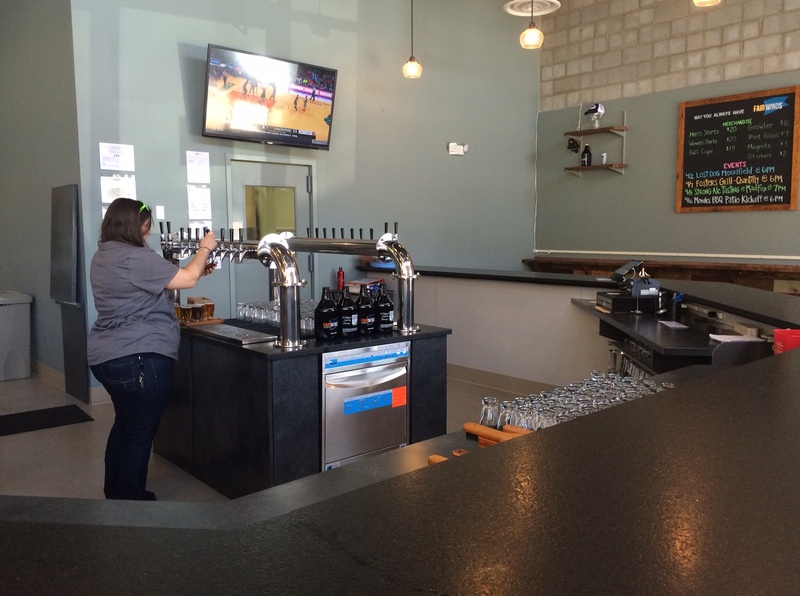 If you’re looking for a fancy tasting room at Forge Brew Works, you aren’t going to find one. It’s very industrial, with bare concrete walls and floor, but ample bar space and additional seating throughout. But really, you won’t care about the décor (or lack of) once you’ve tried their beers. The day we went, they had 11 items on tap . So what’s a girl to do when there are so many choices? Order all 11 beers in sample glasses of course. While we waited for our tasters, I set out all of our cheeses and crackers. Then I immediately decided I did NOT have enough varieties of cheese to handle the wide variety of brews here. But, I “forged” ahead and worked with what I had. While we did pair all 11 with the cheeses, below are our favorite pairings. It was a hard list to pare down, because in all honesty, every beer worked with at least one of the cheeses. Oatmeal Stout: A great stout all by itself, but when paired with a Triple Crème Brie from Wegman’s, it becomes heavenly. Actually, it becomes a café au lait. I love café au lait and I am sure I could have been quite happy drinking this stout and eating an entire block of brie. The Solstice: This is a black saison. Yes, a BLACK SAISON! We paired this first with the Triple Crème Brie. The beer seemed to change from a black saison to a very robust porter. Next we paired it with the Cabot Alpine Cheddar. This cheese managed to mute the toasted malt notes and bring out the saison profile quite nicely. Lorton Common: This brew was intended to be a Dortmunder, but something happened during the brewing process that led Forge to continue with it as a Common. Not surprisingly, you really could taste the Dortmunder flavor profile and we decided to pair it with Collier’s Welsh Cheddar. The beer alone had a nice fruity quality, but the cheese brought the hop flavor forward, without any bitterness. Slake IPA: Full disclosure: I, the Cheesy Beer Wench, do not generally like IPAs. I can appreciate them, but they are not at the top of my list. Except I really, really liked THIS IPA. Great flavor profile, with none of the excessive bitterness I generally associate with an IPA. I could really taste the flavors of the Centennial and Cascade hops they used. We decided to pair this with the Humboldt Fog Goat Cheese from Cypress Grove Chevre. As surprised as I was about how much I liked the IPA on it’s own, I was more surprised by what happened with the cheese. Most of the pairing was “tasted” when I exhaled through my nose after swallowing. For me, the resulting “taste” was very much like having had a cream soda. We did this several times and even Igor agreed this was the most interesting pairing of the day. Forge Brew Works is definitely one of our favorite places. Their brews are consistently excellent and the staff is great. We’ve even been lucky enough to be able to talk with the owner/brewer Matt Rose a few times. Make sure you follow them on Facebook and Twitter to get the latest news about upcoming events and beers. We will definitely be going back there in the near future. Next time, we’ll bring more cheeses. Last night, we had a few friends over and shared some great craft brews paired with several different cheeses. It was a fantastic success and we thought we’d share a few helpful hints in case you too are interested in recreating a “Cheesy Beer Wench” style event in your home. First and foremost, keep the guest list small. We invited only 5 people to join us. We decided this based on two factors. One was the amount of beer we would have to purchase. In order to present what we felt were above average craft brews, we kept the guest list down so we could spend more money on the best we could buy. Second, we wanted to be able to discuss the tastings amongst ourselves, and the more people you have, the more likely it is that someone won’t get the chance to voice their opinions. Next, decide how many beers you’d like to pair and what styles. Do you want to do all of one style from different breweries? Do you want a sampling of current seasonal beers? Or do you want to focus on brews from a particular state, region or country? The mix of beers is entirely up to you. We limited the number of beers to 6 as they were all really high ABV (all above 7.5-8%). Plan on serving a tasting size. Since we’ve been to several beer festivals, we pulled out the glasses we received at those events. They hold the perfect amount of beer: enough to taste and enjoy with the cheese, but not so much that anyone becomes drunk. Stouts and Porters: unless they are smoked, triple crème brie or and cheese with shaved truffles will be great. If smoked, try a chipotle cheddar as well as the brie. IPAs: if it’s a bitter bomb, I have not found a cheese I like. However, there are some very nice IPAs with floral or citrus notes that pair nicely with fresh goat cheese. The only exception I’ve found is black IPAs. You can get away with some triple crème brie because of the malty, roasted notes in the beer. Even though I’ve given you a few ideas about pairings, the best thing to do is experiment, experiment, experiment. If you have a favorite cheese, grab some and a bottle of your favorite beer. If you aren’t sure what you like, see if you have a local cheese shop nearby where they will let you try samples. Some larger stores such as Whole Foods routinely put out samples for you to try. This is a great way to really get a feel for a wide variety of cheeses without having to buy them. Once you have your menu set, send out the invites! We highly recommend telling people to have a light meal before they come. This is especially important if you know there will be people attending who are not used to drinking high alcohol beers. If you have time, cut up the cheeses into bite size portions, usually about an ounce or so. In the case of brie or extremely soft cheese, portion them out on thin unflavored crackers or wafers to make it less messy. If you don’t have time, set all the cheeses out and have guests help themselves before each pairing. We hope you find this helpful and are encouraged to try this yourself! We have had a great time travelling around as The Cheesy Beer Wench, but sometimes, just hanging out with our friends and sharing is even better. The second place we visited on our trip to Richmond was just as delightful as the first. 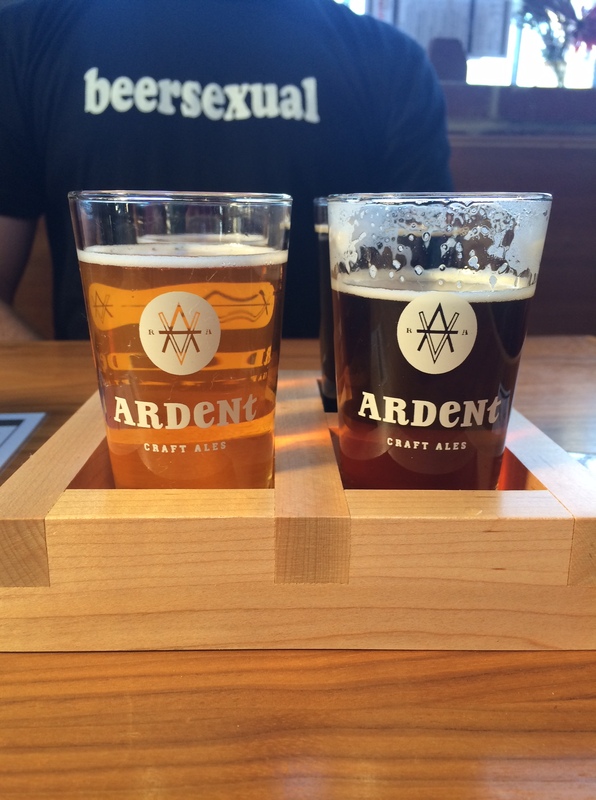 Ardent Craft Ales has a taproom and beer garden, located near the West End area of the city. We sat down and ordered ourselves a flight. It was pretty busy, but not overly crowded. As we pulled out our cheeses, the group at the table next to us was curious enough to ask about it. Boy, did we tell them. We had a great conversation and hopefully they were interested enough to follow this blog. First we tried the Sweet Potato and Sage Autumn Ale, one of Ardent’s seasonal offerings. It was delicious on it’s own, and you got the sage right away. We paired this with a bit of the Winey Goat cheese. The cheese muted the sage flavor a bit, but really brought out the sweetness of the potato. I would also love to pair this beer with a big bowl of roasted butternut squash soup. It truly was “fall in a glass”. Ardent’s Saison is, by far, one of the best saisons brewed in Virginia I’ve had to date. It’s a bit spicy, and you clearly get a fruity aroma. Just an all around great farmhouse style saison. We paired this with the Collier’s Welsh Cheddar first. It smoothed out the crispness of the finish and brought out some floral notes. Next we paired it with Manchego. What surprised us the most was the lavender flavor this cheese brought to the forefront, but that disappeared almost as quickly as it came. If you are a coffee lover, you will want to pay special attention to this! 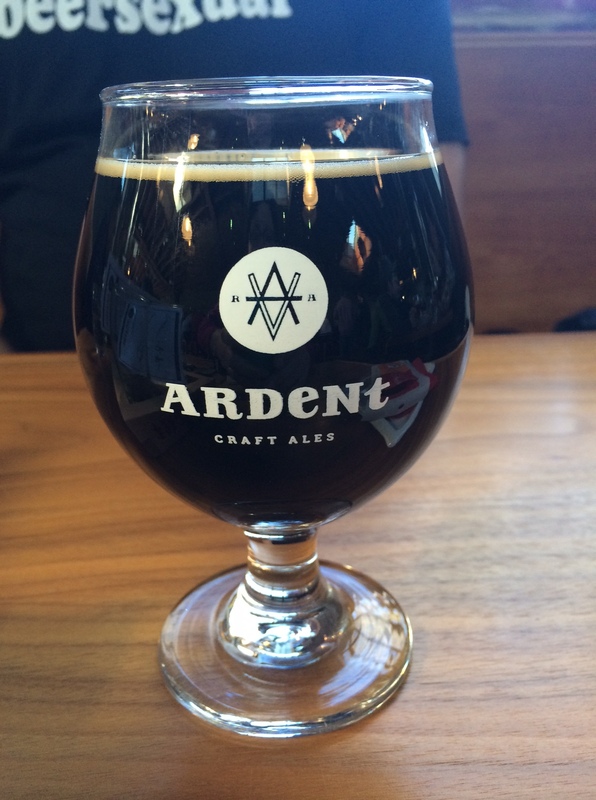 Our last beer at Ardent was the Dark Rye, an imperial stout. It’s not often you see imperial stouts made with rye, and I am generally not a fan of any rye beer, but this was an exception. The beer by itself had a chocolate finish, but then we paired it with our double crème Brie. Unbelievable. The Brie turned this stout into a coffee bomb! Full on, there’s a shot of espresso in this beer, coffee bomb!!! We loved this beer so much we had to get a full glass. We had a great time at Ardent. The taproom atmosphere was casual, and not too loud considering the number of people in there. Our server was fantastic and very helpful. We plan to return in warmer weather to take advantage of the huge outdoor beer garden. Go visit Ardent. You won’t be disappointed. 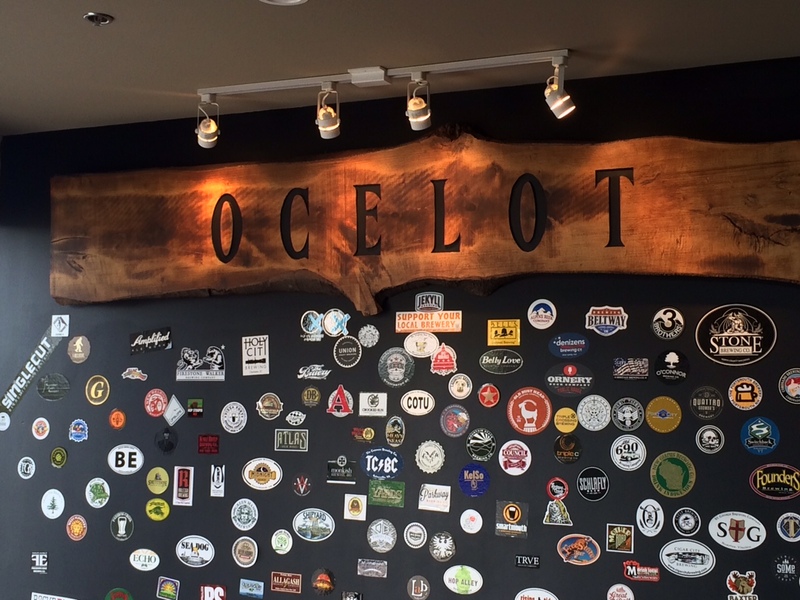 Virginia is quickly becoming a go to destination for breweries. And one of the fastest growing areas is Richmond. Since we are always looking for great beer to pair with cheese, we decided to make a weekend of it in RVA. 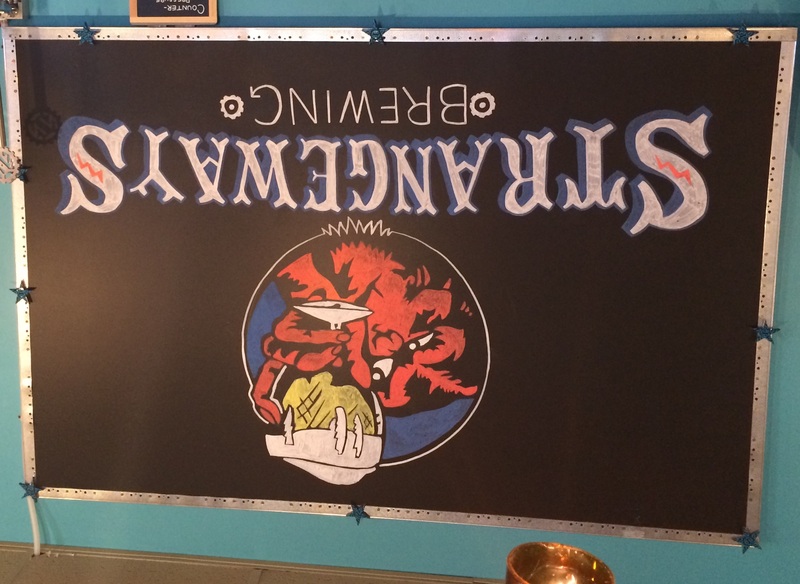 Our very first stop was Strangeways Brewing. Their logo is awesome (a chimpanzee holding a beer), and their brews are equally great. With over 20 things on tap at any given time, it was hard to narrow down our choices. But narrow them down we did, and we were delighted at the results. First up was a Belgian brown ale called Woodbooger, on Nitro tap. We’re suckers for anything on nitro and this one did not disappoint. First we paired it with Collier’s Welsh Cheddar. This sharp cheddar brought out all of the nutty sweetness you typically find in a Belgian brown, and with the beer on nitro, the cheese was even creamier. It was a great pairing. The Gourd of Thunder was next on the list. An Imperial Pumpkin Porter, this brew was nicely spiced and not overly sweet. A double cream Brie amped up the spice profile and dulled any residual sweetness. We also tried it with the Beemster Vlaskaas, an aged Dutch cheese with a slightly sweet and nutty flavor. This cheese brought out some floral notes, which was surprising. I’m generally not a fan of Bocks, but Strangeways’ Virginia Vulgarian was an exception. It is a Bock aged in bourbon barrels. Surprisingly, the ABV is pretty low for a barrel aged beer (6.6%), but the flavor was out of this world. We tried it first with the Welsh cheddar and the beer presented more like a brown ale. But then we broke out the Manchego, a Spanish hard cheese made from sheep’s milk. All of the bourbon goodness was released with this cheese. It was one of our favorite pairings. Vatos Muertos, part of the brewery’s Annihalation Series, is a stout brewed with agave nectar, cinnamon, and various chili peppers. After it’s brewed, it is then put into tequila barrels and aged with cocoa nibs and ghost peppers. Yes, ghost peppers. While we expected a lot of heat in this beer, we were pleasantly surprised at it’s relatively “heat free” profile. With this being a stout, we grabbed some of the Brie. The cheese brought out the earthy flavors of the peppers and none of the heat. The Manchego, however, brings out some of the ghost pepper heat without it being overbearing. Great beer. Our favorite pairings actually happened with a very mild beer in comparison to the ones above. A beautifully done wheat beer, the Uberlin Berliner Weiss on its own is exactly what you’d expect. What we didn’t expect was that 3 different cheeses gave this beer 3 different flavor profiles. First up, we had a bit of Winey Goat, a semi-soft goat cheese soaked in red wine. This cheese pulled out a sour apple flavor. Next, we tried the Brie. The Brie presented the beer as a sort of grapefruit “creamsicle”, without any sweetness. And finally, the Welsh cheddar resulted in a predominately peach flavor from the beer. In all of the pairings of cheese and beer we’ve done, none have given us such a varied flavor profile. It was so surprising and fun! Strangeways should definitely be on your list of places to visit in Richmond. Lots of space to hang out, the tasting room is huge and the walls and shelves are decorated with unique art, most of which is for sale. The staff is also very knowledgeable and helpful. Visit their website here and follow them on Facebook and Twitter to get the latest on different events happening at the brewery. We will certainly be going back here the first chance we get.